Tipler Transfer understands that no two moves are alike, we tailor your move to YOU! Whether it's commercial or residential, local, state, national or international - we can do it all. Need storage? Tipler Transfer has container and climate controlled warehouse storage available to fit your needs. Whether you're moving across Madison or across the country, Tipler Transfer is your choice for the most affordable and professional moving service around. 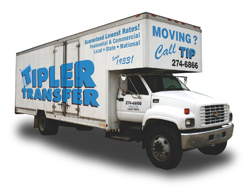 Tipler Transfer has built their reputation on assisting the Madison area with moves since 1933. We take great pride in providing top-notch service for residential and commercial moves – personalized to meet your needs at a value that can’t be beat. We can move you locally, across the state, or to anywhere in the nation. Our exceptional, professional service will make your move stress-free so you don’t have to worry about a thing. We at Tipler Transfer believe your moving needs are our number one priority. We’ll treat your move with the same attention to detail and care that we would use moving our own family. We are truly dedicated to two basic business principles – honesty and integrity. Our team will show up on time with a large enough crew to get the job done carefully and quickly. We understand YOUR time is valuable and waiting around for a truck that doesn’t show up on time or with enough movers to complete the job won’t happen when you choose Tipler Transfer. At Tipler Transfer, no moving job is too big or too small – from a studio apartment to a multi-floor office building – we have the knowledge, ability and experience to get you moved, safely and efficiently. Depending upon your needs, we can also provide you with additional moving services like packing, crating, storage, and unpacking. We offer all the services, materials and manpower necessary for you to have a successful, worry-free move. We will do whatever it takes to not only meet your expectations, but exceed them! We will meet with you to thoroughly review your needs and give you an honest estimate for the cost of your move. We don’t have hidden costs nor will we tack on charges mid-move. We are fully licensed, bonded and insured movers. Call to speak with one of our courteous, knowledgeable representatives at 608.274.6866 and find out more about what we can do for you. We appreciate the opportunity to earn your moving or storage business! © Copyright 2009, Tipler Transfer, LLC.